Our new class term starts on Tuesday 15 January 2019 in the Crescent Arts Centre. Check out all the class details below. From the Shorty George to the Bee's Knees, this fun and energetic course will have you dancing these moves and many more in no time! We will introduce you to the basic steps and then progress onto authentic vintage jazz routines and strolls from the era. A perfect class for solo dancers and groups of friends alike. No dance experience necessary, although being able to follow a sequence of moves is beneficial. Join us to learn the iconic swing dance styles of the early 20th century. This class aims to get you ready for the social dance floor and, along with some iconic dance moves, will work on important elements such as connection, frame, lead / follow techniques, styling, floor craft, etiquette and more. Whether new to dancing or seeking to refresh or fine tune you skills, this class is for you. No dance experience required. Flat, no-grip shoes are advised. Transport yourself back to the Roaring 20s where Charleston was the dance. This class is designed to bring out the performer in you. Learn authentic Charleston moves and routines from the era plus strolls from the 20s through to the 50s. No dance experience necessary, just come along and enjoy this fun filled class. The ‘40s saw places such as the Savoy Ballroom come alive with the sound of swing and the moves of Lindy Hop. In this partner class, you will learn how to swing your partner around the floor in style, learning the classic moves of Lindy Hop and focusing on your lead and follow. No dance experience necessary but you will need to sign up with a partner. It is believed that the Charleston originated from earlier styles of dance such as the black bottom. Even though it is thought to have existed before the 1920′s, it wasn’t until the dance appeared in the Broadway show “Running Wild” in 1923 that it became popular. The dance was performed to “The Charleston”, a song by composer James P Johnson, and soon the musical and dance became a big hit. The Charleston was particularly popular with the Flappers, rebellious young women of the 1920′s known for wearing short dresses, bobbing their hair and listening to Jazz music. The art of solo Charleston and solo vernacular jazz dancing has become popular among modern swing kids and has earnt a competitive place in many of the dance championships. Solo jazz dance battle during the Ultimate Lindy Hop Showdown in New Orleans. Dancers Sharon Davis, Bobby Bonsey, Giselle Anguizola, Lindsay Longstreth and Nathan Bugh battle it out to live music by The Showdown All-Star Band. While newspapers worldwide were reporting Lindbergh's pioneering aeroplane flight across the Atlantic, at Harlem's Savoy Ballroom dancers were creating a new dance they called the Lindy Hop. Originating in the 1920's and 30's, the dance was popularised at dance marathons fashionable in America at the time. Whereas Lindy Hop was commonly associated with black dancers, white American GIs from the 40s often called the same dance the “Jitterbug”. The lindy hop bears the distinction of being one of the fastest dances to evolve in a short period. Its evolution was fueled by competitions held at the Savoy. 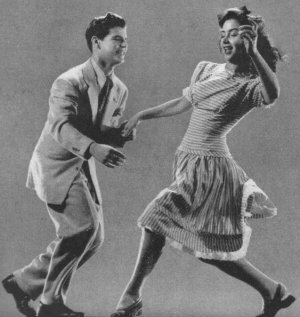 New moves were added as an impulse, and lindy hop became a hugely popular dance. The spotlight of the Champions Strictly Lindy Finals at the International Lindy Hop Championships (ILHC) held in Arlington, Virginia on Saturday, August 25, 2012. The band performing music is Jonathan Stout and His Rhythm Busters. We provide a fun filled hour of dancing in a relaxed atmosphere. Both our classes are aimed at a beginner level and we tailor the class to suit everyone's ability. As dedicated followers of all things vintage, we teach authentic Charleston, Vintage Jazz and Lindy Hop moves, but the main emphasis on our classes is to have fun and enjoy yourself. If you would like a more detailed structure of what you will learn in our classes, please have a look at our resources section for more information. We suggest that you wear comfortable clothing which you can move easily in and flat shoes or plimsolls that do not have too much grip.